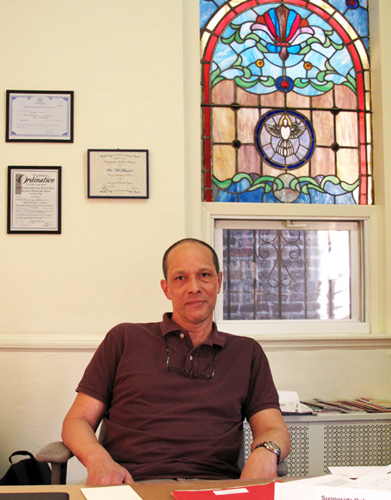 Pastor Neil, as his congregation calls him, was installed as the minister of Sunnyside Reformed Church on the corner of Skillman Avenue and 48th Street on March 22, 2009. At age 58, this is Pastor Neil’s first ministry. Having been raised in a household where he never went to church or read the Bible, he studied Anthropology at Columbia University. He looks back on a long career as a research analyst, including a position at Memorial Sloan-Kettering Cancer Center. He discloses that he encountered some problems in his life but was rescued by “divine intervention” and, as a result, turned to ministry. “One of the things that surprised me most about active ministry is the number of people who use their minister for therapy,” the pastor says. “There seems to be a desire, a hunger to have somebody to talk to when you feel overwhelmed, who is not going to be overwhelmed by what you have to say.” He encounters much “ennui” and discouragement due to unemployment among young people. Some 20-somethings, he says, are caught up in a web of drugs and petty crime. Many of his 45 active and committed members who help finance the church want to see new faces. Paradoxically, though, they also want the church to remain the same. “But you are never going to bring in new people unless you make changes,” Pastor Neil expresses the dilemma.